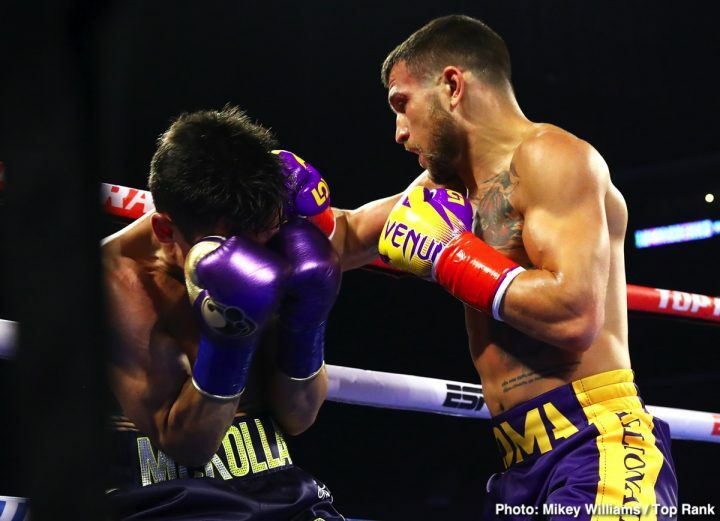 By Aragon Garcia: Teofimo Lopez says he didn’t bother watching WBA/WBO lightweight champion Vasiliy Lomachenko’s fight last Friday night against the badly over-matched Anthony Crolla (34-7-3, 13 KOs), even though he was at ringside at the Staples Center in Los Angles, California. Moreover, Lopez, 21, didn’t think much of Lomachenko’s fourth round knockout win over the 32-year-old Crolla, who he saw as too “scared” to fight. Lopez thinks Crolla just took the fight for money, not because he felt he could win. The unbeaten highly ranked #4 IBF, #4 WBA, #4 WBC and #5 WBO lightweight contender Lopez (12-0, 10 KOs) says he senses a lot of jealousy with the 31-year-old Lomachenko (13-1, 10 KOs) at how rapidly he’s moving up in the sport, and how he’s already lumped in the same category as him without even owning a world title. Lopez says he’s going on his way to becoming a pay-per-view star, and he doesn’t need Lomachenko to accomplish that goal. “I didn’t see anything from Loma that I already didn’t see from Loma,” Teofimo Lopez said to Lomachenko from his fight against Crolla. “On top of that, the dude he was fighting didn’t want to fight. He was scared there. I’m not going to scout Lomachenko. I just knew what was going to happen knowing the fighter. Obviously, he did what he had to do, and that’s obviously what he had to do. I literally didn’t look at it. I didn’t see this fight. I’m here. I pushed for it, but I don’t see the fight happening,” Teofimo said of the Lomachenko fight. “It doesn’t seem like he’s interested in it. Let’s see what happens with the world title, and see what he does, and see if he wants the fight afterwards, you know?” Teofimo said. Lopez is facing highly ranked #4 WBO Edis Tatli (31-2, 10 KOs) next Saturday night in a 10 round fight on the undercard of Terence Crawford vs. Amir Khan on ESPN pay-per-view at Madison Square Garden in New York. This is a highly visible opportunity for the young Teofimo to be seen by many boxing fans. However, Lopez’s fight against Lopez might not be seen by as many boxing fans as one would think due to Top Rank’s decision to put the Crawford-Khan fight card on ESPN PPV rather than regular ESPN, which is probably should be. Crawford and Khan aren’t pay-per-view fighters. Top Rank and ESPN can put the fight on PPV, but it’s not a big enough match for it to likely pull in a lot of buys. Unless ESPN elects to show the Crawford vs. Khan card on replay on regular ESPN, which is unlikely, a lot of boxing fans won’t see or hear about the the fight or the fighters like Teofimo other than with some brief highlights on regular ESPN, and with articles. “The guy is trying to downgrade the work I’m doing because it’s not him. I think I see a little jealously, because the dude [Lomachenko] has been fighting six years as a pro and he’s only making $2 million per fight,” Teofimo said about Lomachenko. “He’s not even on pay-per-view. Even if me and Loma don’t fight, I’m going to move up to 140 next year. They [Top Rank] want to make this fight happen after the Super Bowl. It’s now or never. Let me get the world title, and then hopefully we’ll do in December. The latest I would consider doing it is in January,” Lopez said. Lomachenko has obviously been handcuffed with the way he’ been matched. He’s not a star now due in part to the match-making that’s been done for him, and his personality, which is laid back. Lomachenko uses an interpreter frequently during interviews with the boxing media, and it makes things kind of herky-jerky when asking him questions. Some fighters in the past have been able to become stars in the U.S without having a command of the English language, but those fighters tended to be knockout punchers. Lomachenko is more of a boxer, mover, and lacks the style the American boxing fans like to see from fighters. Lomachenko is too dedicated to not getting hit in his fights, and you can’t become a star if your main focus is to elude punishment at the expense of entertaining the boxing public. Teofimo is the complete opposite. He’s a knockout puncher, who doesn’t move around the ring, and he’s not afraid to put himself in harm’s way when looking to score a knockout. On top of that, Lopez speaks English well, is easy to understand, and always has interesting things to say. Teofimo has a lot of things going for him that Lomachenko doesn’t, and never will have. Lomachenko will never be an over-the-top fighter, who says bold things, and does back flips or shovel maneuvers after knocking out his opponents. “What I’m saying is, I don’t need a Lomachenko fight to make me a superstar,” Teofimo said. “That’s what I’m saying, but the fight fans want to see it. He has two titles. I want to be the best. I don’t want him coming out thinking he’s the s—. He’s not. I want me to come out as the best fighter, and then move to 140. He doesn’t want the fight. There’s so many things he’s using an excuse, and people are buying it. Everyone is buying into it, because it’s Lomachenko,” Teofimo said. Teofimo should move on and look in another direction instead of wasting time on Lomachenko, who doesn’t seem to be interested in that fight. On one hand, Lomachenko says Teofimo needs to have a world title in his possession for him to fight him, but then on other hand, he wants Top Rank to have him matched against all the current 135 lb champions to unify the division. If Top Rank does that, which appears they’re looking to do, then Lopez won’t get a chance to win any of the belts at lightweight in 2019 before he moves up to 140 in 2020. So in other words, Teofimo won’t get a fight against Lomachenko, who plans on moving back down to 130 after he unifies the 135 lb division this year. It did look a lot like Crolla was just there for the payday against the 2-time Olympic gold medalist Lomachenko last Friday night, and not because he thought he could win. Lomachenko had the 32-year-old Crolla on the verge of being knocked out in the closing seconds of the 3rd round. If not for referee Jack Reiss choosing to let the fight continue on, Lomachenko would have scored a knockout in round 3. Crolla looked hurt. It’s anyone’s guess what was going through the referee Reiss’ head to allow the fight to continue. Ultimately, the referee did Crolla no favors by not stopping the fight in the third round, because he was smashed in the fourth round and put down face first on the canvas. “If the fight [against Lomachenko] happens, great,” Teofimo said. “I’m going to be so happy. But do I see it happening? No. The way I see he is about things, and how they’re pushing it away, it’s not like I need this fight. I don’t need this fight to make me a superstar, because honestly without the [world title] belt, they’re already putting me in the same category with him. So obviously we’re doing something right. On top of that, if he’s such a mega-fighter and superstar, why is none of his fights, and why can’t he make a pay-per-view fight? If me and Lomachenko fight, it’s great. It’ll be on pay-per-view, but it’s not because of him. Honestly, it’s because of me, because that’s going to be a fight obviously worth paying for. It’s going to be like a Manny Pacquiao-Floyd, but not that kind of competition, because it was horrible. I’m saying they need that kind of dance partner. They can make me the super villain,” Teofimo said. 2. No energy during interviews. Lomachenko looks and sounds half asleep much of the time. 5. Too modest. Modesty doesn’t sell in boxing, period. All the wasted time that Lomachenko is putting into trying to unify the lightweight division isn’t increasing his popularity, because he’s not fighting the right guys. No one wants to see Lomachenko fight Richard Commey. Fans didn’t care about Lomachenko’s mismatches against Jose Pedraza and Jorge Linares. The fans want to see Lomachenko fight the guys on the above list. They want to see Loma take risks with his career instead of defending his numerous titles against guys that they don’t care about. Lomachenko just needs to get a clue and fight the guys that the boxing public cares about like Teofimo. “What I’m basically saying is with a Lomachenko fight or without a Lomachenko fight, we’re going to make pay-per-view fights through me, with or without him,” Teofimo said. “That’s not even with three years in the sport. We’re almost there. My main goal is to get the world title, and then match-up hopefully fights like this. It’s the Takeover. For all the fans, hop on the Teofimo Lopez express. It’s going to be a great ride, man. Choo-choo,” Teofimo said. Teofimo is right about him becoming a star with or without Lomachenko. Teofimo would have been better off if he’d already moved up to 140 in 2019. That’s where the interesting fights are at. The 135 lb division is a dead one now. There’s no one there except for Lomachenko, and he’s not fighting anyone interesting. Mikey Garcia probably won’t come back down to 135, because he knows there’s no one to fight in that division. Mikey would rather take high risk fights for big paydays than low risk fights against boring opposition for smaller paydays at lightweight. If Lomachenko was a little more courageous, he’d follow Mikey’s lead and move up to 140, and then 147 to get some of the big money before he gets much older.